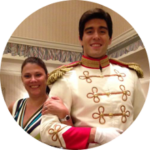 On our last visit to Disney, we had the pleasure of dining at one of our all-time favorite restaurants at Disney Springs, Raglan Road. If you’ve never been before, let me fill you in. 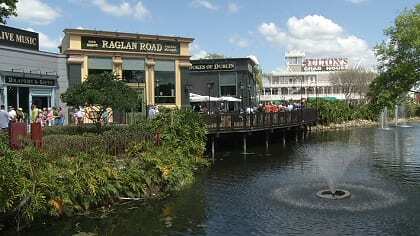 Raglan Road is Orlando’s only authentic Irish pub. It was built entirely in Ireland, disassembled, shipped to Orlando, and rebuilt in Disney Springs. The bars are 130 years old! This family-friendly establishment serves up classic Irish fare for brunch, lunch, and dinner daily alongside the best entertainment there is. Now, when you think classic Irish fare, you think fish n’ chips, shepherd’s pie, and bangers and mash, and you aren’t wrong. While Raglan Road does offer these drool-worthy dishes (at a much higher-than-normal level mind you), there is so much more on the menu that is worth exploring. So, let’s kick up our heels and get started. Normally when we visit Raglan Road, we always start with the Dalkey Duo. This delicious appetizer is battered cocktail sausages with a Dalkey mustard dipping sauce that I just can’t seem to get enough of. This time, we ordered the Drunk Mussels that were highly recommended, and after eating them, I can see why. It’s 1/2lb of Blue Hill Bay mussels in a beer, white wine, and garlic broth, and I almost picked up the bowl to drink the rest. If you are a fan of shellfish, you can’t go wrong with this dish! The decision on what to order for a main course was a bit more difficult as there are many options to choose from. We decided on the Stewbaa and the Gnocchi Sea Gnocchi Do. The Stewbaa is a white stew with braised lamb, root vegetables, herb dumplings and mint coulis. It was hearty and filling, and truly warms your soul. The lamb was tender and paired perfectly with the vegetables and dumplings, and the mint coulis added the perfect amount of herbiness to the dish. The Gnocchi Sea Gnocchi Do was something I have never seen before and will absolutely try to recreate in my kitchen. It’s handmade potato gnocchi, seared Georges bank scallops, and crispy pork belly in a white wine butter sauce with tomatoes and kale. The creaminess of the gnocchi perfectly complimented the beautifully seared scallops and the crispness of the pork belly making for a very delectable meal. We all know that calories don’t count at Disney, so why not have dessert? Now, Raglan Road is known for their bread and butter pudding. It’s truly the best I’ve ever had, and that is not an exaggeration. Since we’ve had it before, we decided to change it up a bit and get something different, so we opted for the Fluffy Lemon Clouds and Chocolate Heaven. The names are pretty fitting! Fluffy Lemon Clouds is a deliciously intense lemon curd tart topped with ‘clouds’ of meringue. The Chocolate Heaven is a flourless chocolate cake topped with chocolate ganache, fresh berries, and whipped cream and is truly heaven on a plate. I mentioned earlier about the bars being from Ireland, but they aren’t the only thing that hails from the Emerald Isle. While you are busy licking your plate (Try not to, I dare you. We aren’t looking), you will be fully entertained by dancers and musicians who are hand-picked from Ireland to perform. After the audition process, the bands and dancers have 6 weeks of rehearsal in Ireland and then fly across the pond and have 2 additional weeks of rehearsals in Orlando. Besides Riverdance, Raglan Road has the longest running Irish production in the US! Throughout the course of the evening, the dancers will go through the restaurant and pick kids to join them on stage. They teach them a little dance routine and give them a certificate when they are done. My son has done it a few times and it’s always brings a smile to the audiences face. Plus, it’s a perfect photo opportunity for parents! 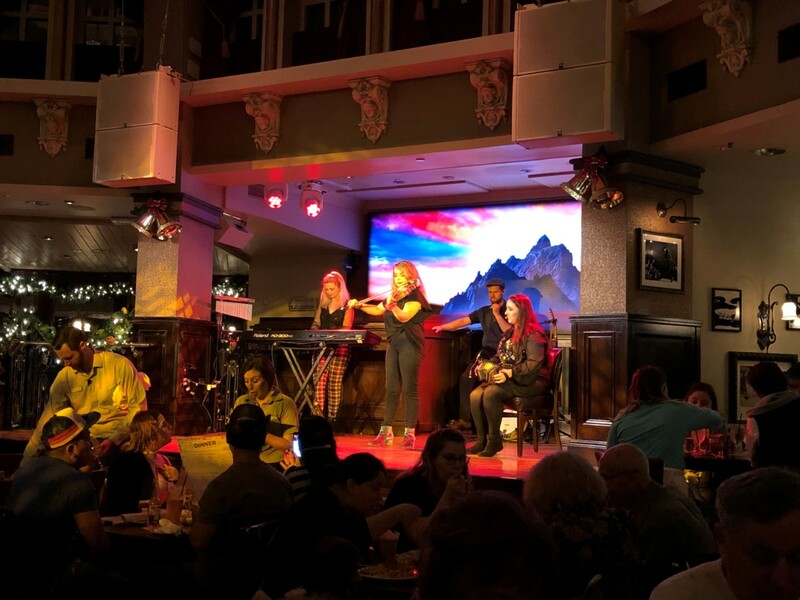 If you are looking for a new fun and entertaining restaurant for your next trip to Disney Springs, I cannot recommend Raglan Road enough. The service is top notch, the food is impeccable, and the entertainment can’t be beat. Slainte! Edited to add: The picture of the Gnocchi Sea Gnocchi Do was a little too dark to see all of the goodness, so here is a better one for you.